These frames are crafted from weathered wood that has finished its service holding up fences, bunkhouses, and barns. 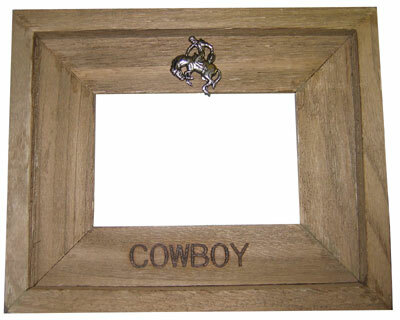 This one has a Cowboy theme to it, complete with a pewter bucking horse and rider. "Cowboy" is burned into the lower long edge. It will accept a 4 X 6 Picture, and the overall dimensions of the frame are 8" X 10". This frame has provisions for standing on a table.